The 8:24 group fights for 8 seconds on the small campus board ledge. We conducted a 4-Week Mini study comparing the effectiveness of two hang board dead hang duration intervals (4 seconds vs. 8 seconds) to increase finger strength assessed by a dead hang for time. Results “seem” to indicate the 8-second intervals were more effective, but they are suspect because the 4-second results varied widely. During the Spring 2018 Rock Climbing Pre-Season Training Cycle we deployed 20:40 hang board intervals (20 seconds work, 40 seconds rest) but did not see the level of strength improvement post-cycle I’d hoped for. Post-cycle I did some research and was unable to find material which searched for the best hang board training work. Other coaches deploy work intervals ranging from 3 to 15 seconds, with varying rest intervals. I did find a study analyzing movement patterns and work at elite bouldering competitions. The researchers found that the average time per handhold over the course of the competition was 8 seconds and it appears this durations is what many hang board interval protocols are based on. The goal of this study was to begin the work to identify the optimal dead hang work interval and work to rest interval for increasing rock-climb specific finger strength. 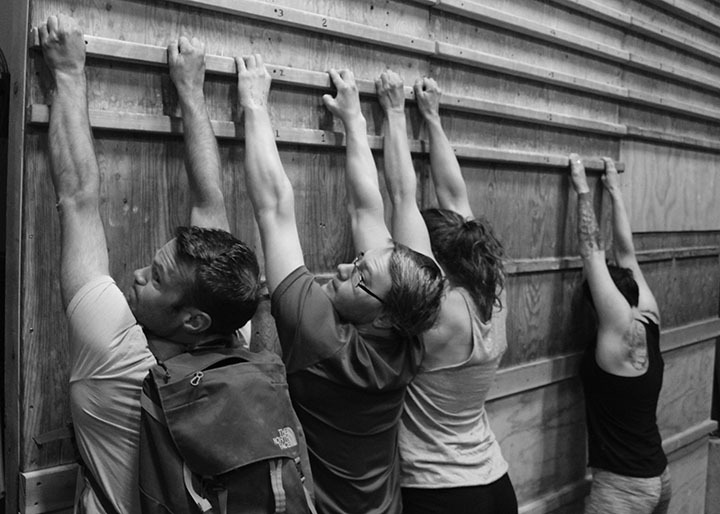 Prior to the cycle, each athlete completed a dead hang for time assessment on MTI’s hardest campus board – an edge with of approximately 1 inch. Post cycle, each athlete reassessed his/her dead hang time. Rest 2 minutes between 8 Round efforts. The dead hangs are being completed, as much as possible, on the same ledge as the assessment. When athletes failed an interval, they are moved to a wider ledge. Likewise, if athletes are able to make it through all their prescribed dead hang sets on the assessment ledge unloaded, weight was added in for the form of a backpack an initial 20-pound jump, and then 10 pound jumps for follow-on progressions. Which dead hang work interval performs better – 4 second or 8 second – to improve rock-climb specific finger strength measured by a dead hang for time on a 1-inch ledge. What we did learn is that the 8-second work to rest interval improves dead hang performance an average of 28%. This is significant. Clearly, the results here were limited by the small sample size for both groups. As well, the inconsistent 4/12 group results are difficult to explain. Moving forward, however, we did find that the 8-second work intervals improved dead hang for time performance. Next would be to test the work to rest interval. For this study, we deployed a 1:3 work to rest interval for each effort – 8 seconds work, 24 seconds rest. An obvious next step test would be to test 1:2 and 1:4 work to rest intervals against these 1:3 results using an 8-second work interval, – so test the effectiveness of 8:16, and 8:32 versus these results for 8:24.